Even if the Philippines is a tropical country, not every part of it awakens the nature lover within us. The concrete and crowded city areas would speak for themselves and the provincial areas may not exactly provide you that extra comfort ala pensioda or pensioner. Regardless of where you stand, you deserve a good pampering in a quiet and sophisticated hideaway. 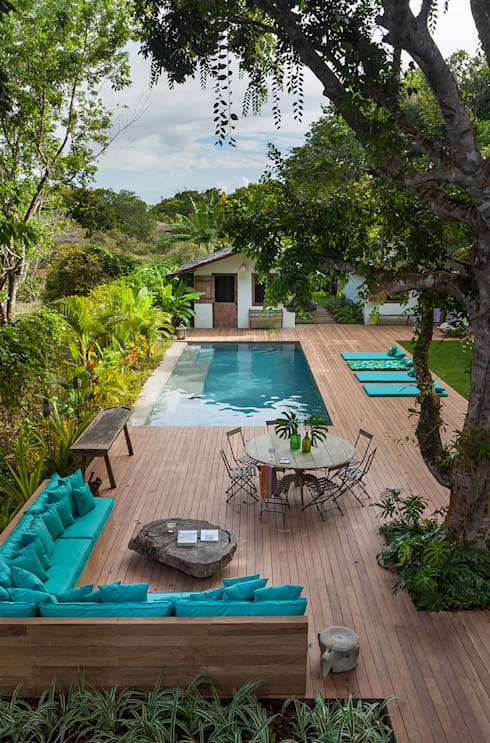 So, capture the exotic ambiance of this vacation villa in Bahia, Brazil where the lush tropical greens and the sun smile to give you that ultimate paradise you can call your own. Warmly opening its doors to guests, this main facade showcases exotic and sophisticated combined. 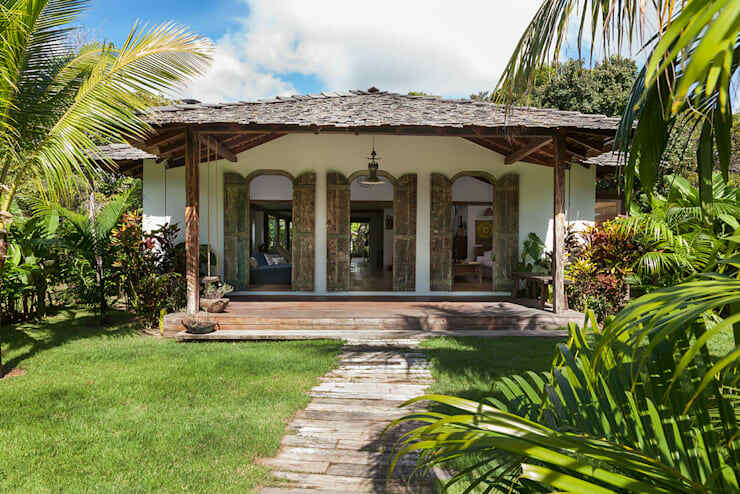 The presence of palm trees by the entrance and the short path walk surrounded by a well-maintained lawn which lead to the indigenous material-clad porch are like elements of a photograph of your dear provincial home on a picturesque afternoon. Here, the rustic tall double doors take you to post-war Latin America. 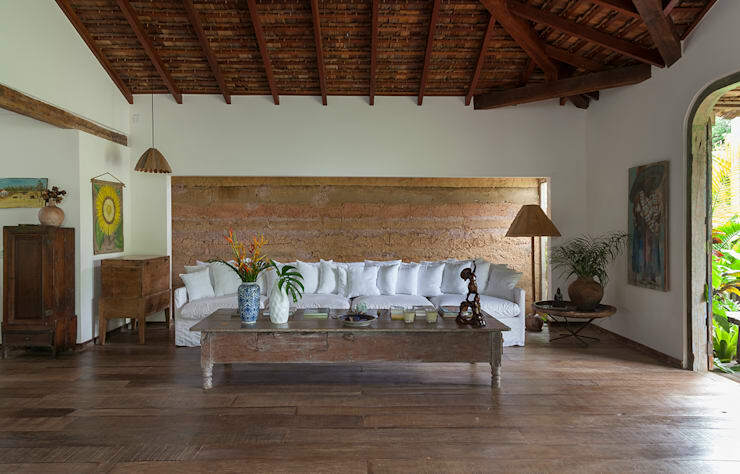 Both raw and classy, this living room reveals the handiwork involved in the house's construction through its high ceiling made of carefully assembled wood which lessens heat circulating inside. Complementing this are the other brown and native furnishings used like the chest, the lamp, and that coffee table. Artistic ornaments are also hung on the white walls to keep things interesting. The furnishings are also placed in such ways that don't obstruct the main walk way which gives plenty of room for movement in this area. The opposite side of the same room includes two couches which can be considered as day beds for the leisure lovers. 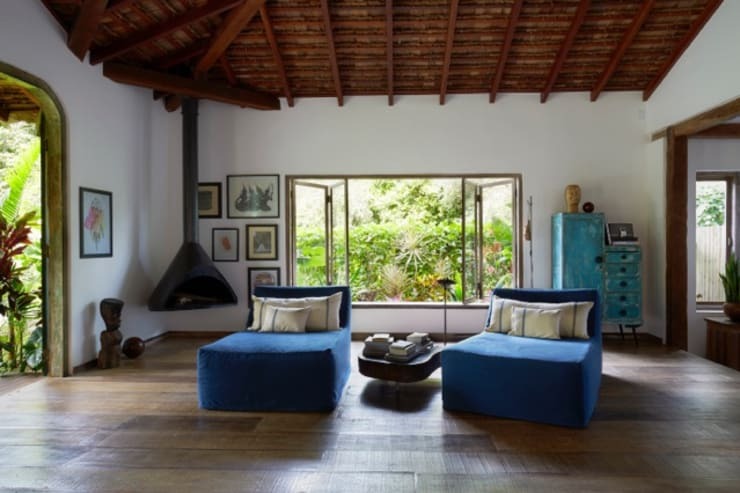 Again, the wide windows which open to a lush greenery exemplify how cool this living room can be—perfect for those who aim to get a bit of a shut-eye by mid-afternoon. During cooler months, the fireplace performs a crucial function to this absolutely breathable space. The cozinha or kitchen might be stocked with great tropical drinks that you want to casually drink on a warm Friday night. 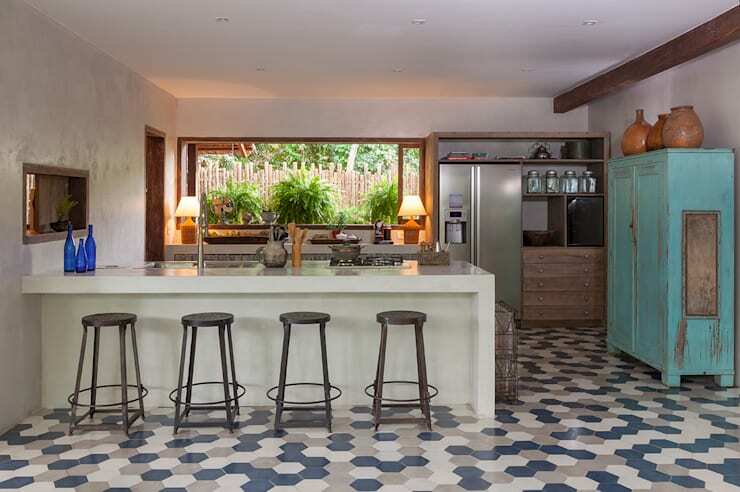 This kitchen looks like it can be turned into a rustic, local bar with that counter and stools on top of the interesting flooring. We also love how the two lamps by the wide open window set a romantic mood which may also inspire you to cook an exotic meal. Check out how shabby chic that turquoise cabinet looks! 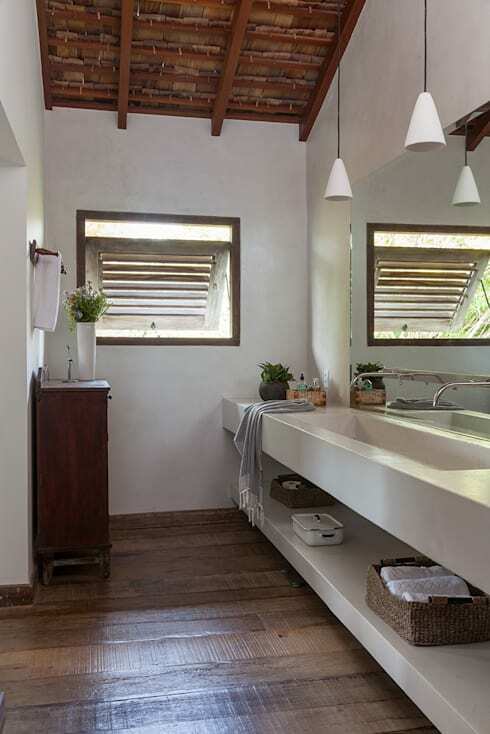 The comfort room takes its cues from the simple white, wooden, and wide mirror details which remain true to the theme of this house. The interesting side window also gives this room good ventilation. 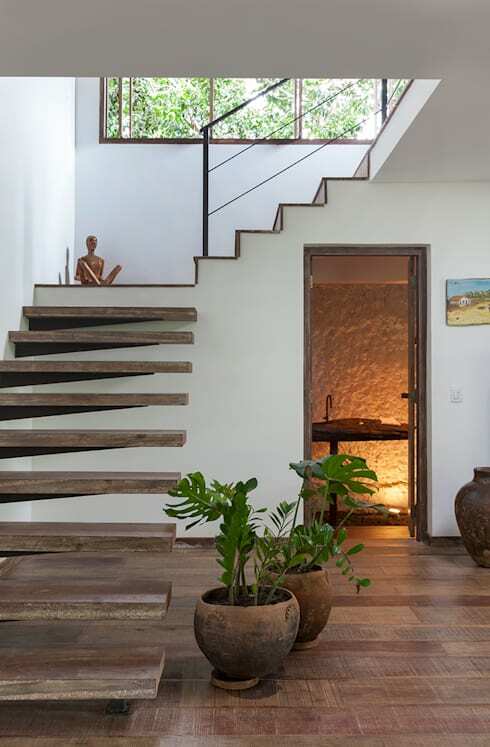 The stairway is a wonderful mixture of native and modern through the clever structure of the wooden staircase from the main floor. An amusing sculpture greets passers-by by the landing and leads them to this industrial set of stairs because of the black metal railing. Meanwhile, visible from this view is the staircase comfort room which, emphasized by the soft lighting, is an equally interesting blend of the basics and modern design evidenced by that textured wall. Proving further the coolness of this house are those wide glass doors supposedly covering the back porches which are actually part of the dining area where the long table with the retro white chairs are. You might remember the interesting floor patterns from the kitchen. Here, the ceiling is different from the main living room. Nevertheless, we would love to lay down for a moment on that hammock, although, we might fall sound asleep instantly. Nothing probably says vacation more than this pool area. Here, you have a solid wood flooring serving as a base for the round table where al fresco meals would be eaten, the L-shaped couch which would accommodate more than a handful and apparently match with the pool side mats for those getting that exotic vacation tan. Yes, this gets our double thumbs up. Interestingly, the descending steps to the pool is situated on the opposite end of the lounge mats. We also think that hanging soft lights on that tree would look lovely and would add nice lighting to an exciting evening get-together should there be such. 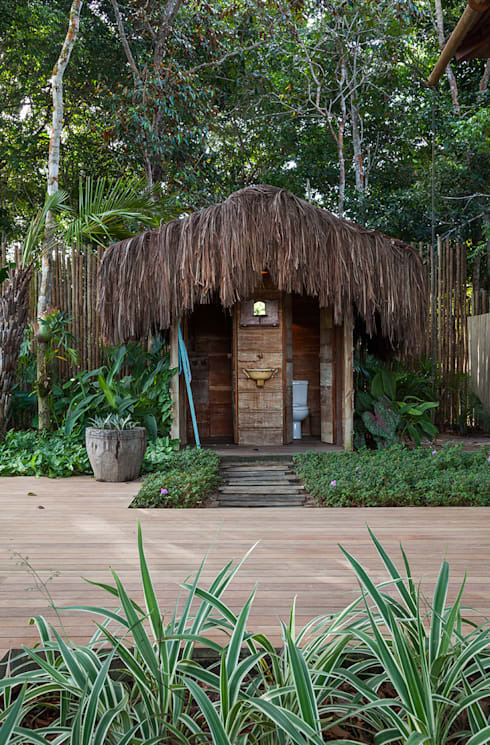 This tiny cabana that houses the pool side comfort rooms is also a shabby yet lovely addition which actualizes the tropical ambiance of the place. 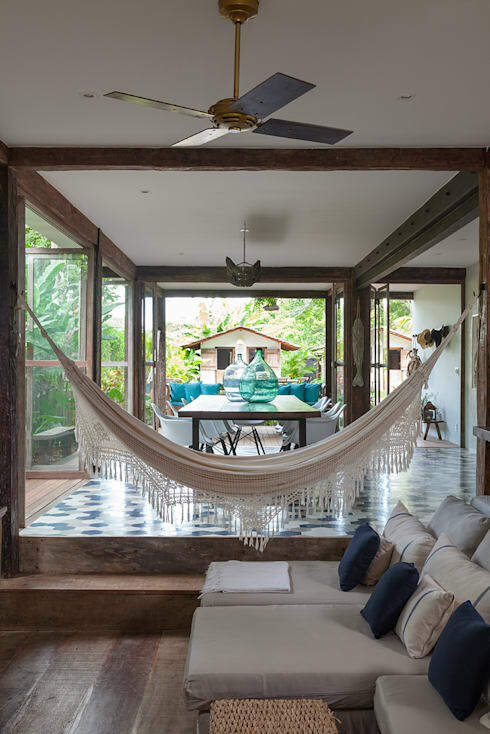 If you're simply looking into bringing this kind of tropical escape into your home, check out the 8 tips on turning your home into a tropical paradise.